We all want our homes to be a safe place for our children as well as a place where they can learn self-sufficiency. There are many crucial life skills taught in the kitchen alongside the many laughs and interactions with family and friends which take place there over the years. The kitchen really is the hub of the house and now more than ever families are choosing to create seamless spaces where the lines between living space and work space are blurred. 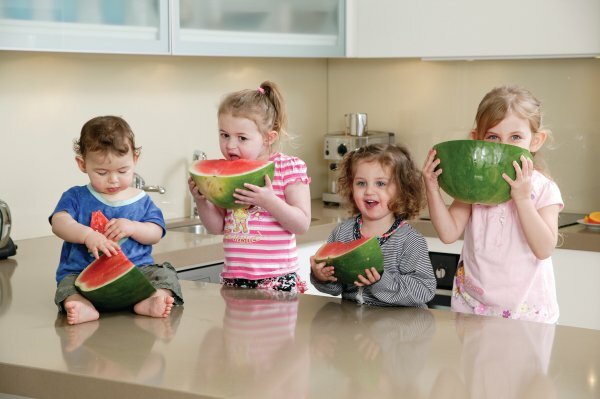 Because of this, family kitchens need to be planned with child-safety in mind as well as fitting with the aesthetics of the home and fostering child participation in food preparation. It’s somewhat bittersweet for me writing this article with my tragic ’80s salmon-coloured kitchen in my sights. Yes, we have a great open-plan area but I’ll freely admit to being more than just a bit wistful about the divine designs from Kitcheners Kitchens and wish we had thought of replacing ours years ago with future children in mind. 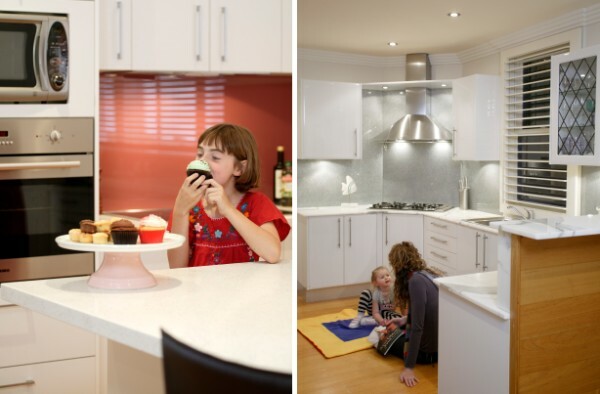 I had the pleasure of speaking with Michael Kitchener from Kitcheners Kitchens about his child-friendly kitchen designs. Seventy-two per cent of his clients are families with children under fourteen years of age and most of his design team are parents, so it’s a company which truly understands the needs of families with youngsters. Before any design work even takes place, the family is assessed in terms of what it requires from a kitchen space. What are the specific things you suggest when designing a kitchen for families with babies and/or very young children? Keep ovens and microwaves in wall cabinets rather than under the bench. Plan space for a dishwasher. Select rounded or curved handles and avoid bar handles. Install magnetic child door locks – these are not seen from the outside of cabinetry and can be turned off when the kids are old enough. Consider storage such as walk in pantries. Plan for the possibility of more kids. 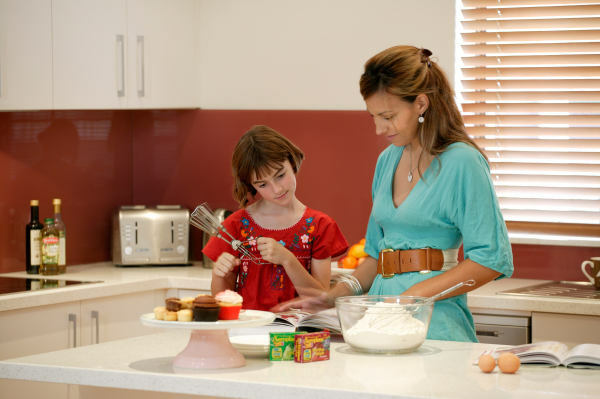 Island bars are a great place to feed kids when you are preparing other meals in the kitchen. Open plan kitchen design which looks into the living area. You can keep an eye on the kids while they watch TV or play. 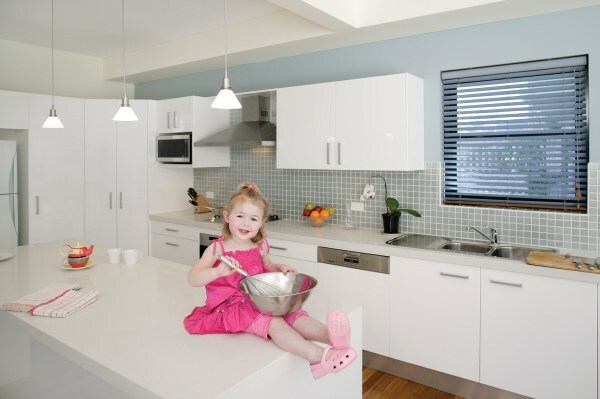 Tell us about a project which has really stood out in your mind as being the ultimate child-friendly kitchen. A recent kitchen we created in Malabar (click to see pictures) – the owners of a beachside home sought an open space that integrated the kitchen with the kids’ living areas. What they really loved was how we created a stylish eat-in island benchtop which is great for the young kids eating an early dinner or enjoying breakfast. It also makes it very easy for the parent to keep an eye on the kids whilst cooking. What’s the best colour and texture cupboard door for hand-smears and scratches? A matt laminate is the most durable product and will also not pick up those hand smears. It is also the most affordable range. I would advise against gloss polyurethane (or any polyurethane) as this is the most likely finish to get scratched. Tell us about the experience customers have when they approach Kitcheners Kitchens about a new kitchen. What is the process from when they walk in the door right through to the finished product? Kitcheners’ customers appreciate our dedication to custom designing beautiful kitchens that are made just for them. Today, most couples with young families are time poor. That is why Kitcheners Kitchens has an online showroom and an extremely comprehensive website where people can research their kitchen needs from design ideas to different finishes. Clients book in a design consultant to visit their home. The designer will go out to the family home and examine their kitchen and get a design brief to understand their needs. The designer will also bring into the home the equivalent of a mobile showroom to go through all the physical finishes and textures. After understanding the design brief, the designer will draw up a new kitchen plan and quote on it there and then to exact specifications, with a layout to suit the family’s schedule and budget. Furthermore the designer will create something that allows for any further changes to the family structure, such as the birth of a new child. Once the design and quote has been approved, the kitchen is then check measured by a technical advisor and put into production. Depending on the finish selected, a new kitchen can be delivered in a matter of weeks. If you’re planning on a new kitchen, be sure to get a quote with Kitcheners! It’s worth noting that the company plants a tree for every kitchen installed and is the first kitchen company in Australia to be endorsed as a ‘Climate Friendly Business’.